If you are sitting on the couch in front of a football game instead of spending a few hours improving your hunting property, you chances of success during the upcoming hunting season are not going to be as good as they could be. Winter is seen as down time for most hunters, but there are a few simple improvements you can make to your hunting property during the cold months that will pay dividends. One of the best ways to hold deer on your property is to improve the food and bedding cover areas. One of the best ways to improve both is to remove undesirable trees in order to let more sunlight to the forest floor and increase edible plants. Taking a few trees out can really help make the area more attractive to deer. Hinge cutting is done by cutting a tree at an angle about shoulder height, about ¾ of the way through. Just cut until the tree starts to fall and let it fall. The fallen tree will provide cover and browse for the deer during the winter. It also provides thermal cover, security cover for bedding, and allows more sunlight to the forest floor. Hinge cutting done right will allow the tree to continue to grow new leaves each year for at least a couple years. 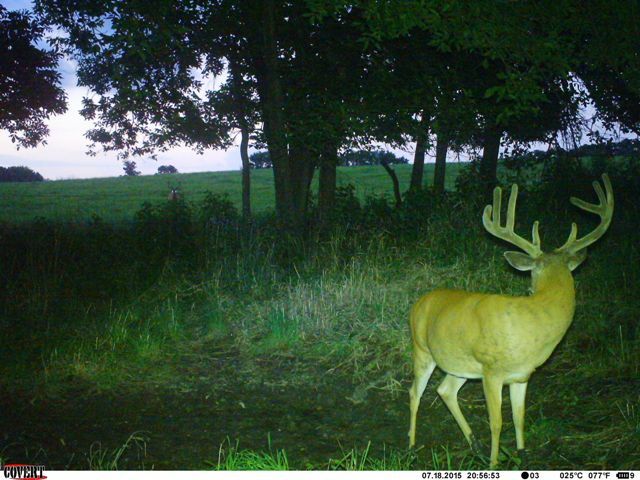 One of the best ways to keep the neighbors from shooting the bucks you have been letting grow is to provide attractive bedding cover and improve actual bedding sites. 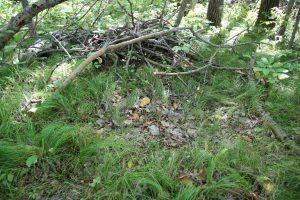 A lot has been written about improving bedding cover, but not so much is known about actually creating specific deer beds. Bucks like to lie with their back against some sort of structure, just like a big old bass likes a brushpile to hide out in, deer like to get up against something that helps them feel secure. They do not like to lie down on rough ground such as rocks or sticks. You can encourage deer to lie in the beds you make by creating the perfect deer beds. Clean the sticks and rough objects out and make small “C” shaped piles of limbs, and you will be amazed at how fast the deer will begin using them. 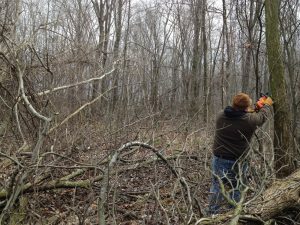 Winter is a good time to clean up the trails you use to approach your stands and food plots. clear logs and debris from the trails and mow them if snow conditions permit. Sneaking to your stand sites can be made much easier by having a smooth clean place to walk without making too much noise or movements. If you do not have good entry trails to your stands along food plots, make them in the winter. Make them with a curve right before the plot so you can approach the field in secret. If you make a trail that goes straight to the plot and there are deer already in the plot when you approach or leave, they can see you coming. Put a bend in the trail to avoid that. Winter is the time to put lime and some other fertilizers on your food plots. Have your soil sampled so you know what fertilizer you need. Have the PH checked also so you know if you are too acidic or alkali. Do the ones that can be applied in the winter which will save time in the spring and summer. Lime can be applied right on top of the snow. In the late winter right before the snow goes off you can apply clover seed. Clover seed is very small and will germinate well when spring rains and snowmelt come. This is called frost seeding and it allows the seeds to hit the ground and be ready once the temperatures are warm enough for germination. The intrusion and human scent caused by trimming branches and saplings to create shooting lanes around your stands can really put deer on edge when done too close to the season or during the season. Doing it in the winter allows you to trim these out without affecting the deer movement during the hunting season. Take a pole saw and brush nippers and go to work. Don’t overtrim of course, just make sure you have a clear shot in any direction you anticipate needing one. This can be accomplished by working in pairs of course, especially if your stands are in the trees. Have one person get up in the stand and point out the limbs that need trimming. Scientific studies have consistently shown that the more coyotes you have on your property, the lower the fawn recruitment is going to be. 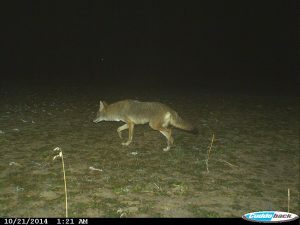 If you are seeing coyotes on your game cameras, or if you are seeing a significant number of mature does with only one fawn or no fawn, you probably have a predation problem. Time to take action. Coyote calling is fun and effective. It’s a great way to thin out the population and get some exercise and fresh air during the winter. Trapping and snaring coyotes is the most effective way to curb the numbers. If you don’t have the interest in catching them yourself, find a local trapper you can trust and give him a key to the gate. Most trappers will control coyotes if you also allow them to take other species such as raccoon and fox. It’s well worth the trouble to maintain a good relationship with a trapper. Get off the couch and spend some time on your hunting property this winter. You will definitely see the difference come next hunting season. Here’s a great video explaining how to do hinge cutting.